The first image captured by one of NASA's Mars Cube One (MarCO) CubeSats. 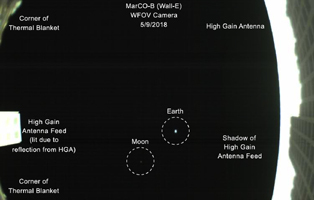 The image, which shows both the CubeSat's unfolded high-gain antenna at right and the Earth and its moon in the center, was acquired by MarCO-B on May 9. MarCO is a pair of small spacecraft accompanying NASA's InSight (Interior Investigations Using Seismic Investigations, Geodesy and Heat Transport) lander. Together, MarCO-A and MarCO-B are the first CubeSats ever sent to deep space. InSight is the first mission to ever explore Mars' deep interior. If the MarCO CubeSats make the entire journey to Mars, they will attempt to relay data about InSight back to Earth as the lander enters the Martian atmosphere and lands. MarCO will not collect any science, but are intended purely as a technology demonstration. They could serve as a pathfinder for future CubeSat missions. The MarCO and InSight projects are managed for NASA's Science Mission Directorate, Washington, by JPL, a division of the California Institute of Technology, Pasadena.